Consumer credit scores have been artificially inflated during the past decade and are covering up a very real danger lurking behind hundreds of billions of dollars in debt. And when Goldman Sachs is the one ringing the alarm bell, you know the issue may actually be serious. Joined by Moody’s Analytics and supported by “research” from the Federal Reserve, the steady rise of credit scores during our last decade of “economic expansion” has led to a dangerous concept called “grade inflation”, according to Bloomberg. Grade inflation is the idea that debtors are actually riskier than their scores indicate, due to metrics not accounting for the “robust” economy, which may negatively affect the perception of borrowers’ ability to pay back bills on time. This means that when a recession finally happens, there could be a larger than expected fallout for both lenders and investors. On the surface, this disappearance of subprime borrowers is good news. But is there more than meets the eye to the American consumer’s FICO score renaissance? The problem is most acute for smaller firms that tend to lend more to people with poor credit histories. Many of these firms rely on FICO scores and are unable to account for other metrics, like debt-to-income levels and macroeconomic data. Among the most exposed outstanding debts are car loans, consumer retail credit and personal loans that are doled out online. These types of debt total about $400 billion – and about $100 billion of that sum has been bundled into securities that have been sold to ravenous yield chasers “investors”. Meanwhile, cracks are already starting to show on the surface: there has been a rising number of missed payments by borrowers with the highest risk, despite the past decade of “growth”. And now that the economy is starting to show weakness, these delinquencies could accelerate and lead to larger than expected losses. “Borrowers’ scores may have migrated up, but inherently their individual risk, and their attitude towards credit and ability to pay their bills, has stayed the same. You might have thought 700 was a good score, but now it’s just average,” deRitis continued. Goldman’s Young attributes the rise in missed auto loan payments to the change in scores. The Federal Reserve Bank of New York said the number of auto loans at least 90 days late topped 7 million at the end of last year. Marketplace and peer to peer lending has also been showing signs of stress. Missed payments and writedowns increased last year, according to NY data and analytic firm PeerIQ. “We don’t see the purported improvement in underwriting just yet,” PeerIQ wrote in a recent report. And the pressure isn’t just showing up in auto loans and marketplace lending. Private label credit cards, those issued by stores, instead of big banks, saw the highest number of missed payments in seven years last year. “As an investor it’s incumbent on you to do that deep credit work, which means you have to know as much as possible about how things should pay off or default. If you don’t think you’re being paid for the risk, you have no business investing in it,” Russell-Dowe concluded, stating what should be – but isn’t – the obvious. This entry was posted in Mortgage and tagged credit score, FICO Score on April 8, 2019 by Bone Fish. Starting September 21, 2018, placing or lifting a “credit freeze” – aka “security freeze” – will be free for all Americans in all states. In response to the Equifax-hack uproar and the grassroots movement it triggered, after the personal data of nearly half of all adult Americans had been stolen, Congress passed a bill in May that contained a provision about credit freezes. It requires that all three major consumer credit bureaus – Equifax, Experian, and TransUnion – make credit freezes and unfreezes available for free in all states. Under most existing state laws, credit bureaus were able to charge a fee for placing and lifting a credit freeze. This could add up: for an effective credit freeze, you need to freeze your accounts at all three major credit bureaus, and pay each of them – and then pay each of them again to unfreeze those accounts if you want to apply for a credit card or loan. The new law also requires credit bureaus to fulfill consumer requests for a credit freeze within one business day if made online or by phone, and within three business days if made by snail-mail. Credit bureaus collect personal and financial data on just about all adult Americans, whether they know it or not. These dossiers are extensive. They include the Social Security number, date of birth, address history, credit-card history, loan history, bank relationships, payments history, etc. These dossiers are used to build a “credit report.” This is an extensive file (not just a credit score) that shows in detail your entire credit history – such as mortgages, other loans, credit cards, late payments, etc. These reports are sold – you’re the product – to third parties, such as lenders, credit-card promoters, and others. Credit bureaus hate credit freezes because they cut into their revenues. But years ago, state laws forced them to make credit freezes available, though credit bureaus could make the process of freezing and unfreezing the account cumbersome, time-consuming, and costly. Now, under the new federal law, it’s easier and free. When you put a credit freeze on your account with the three credit bureaus, they can no longer release this report to third parties, and it becomes impossible to open a credit-card account or bank account in your name – impossible for you as well as identity thieves. After you place credit freezes on your accounts and then want to open a new loan account or open an account with the Social Security administration (yes! ), you need to first lift the credit freezes. All this has now become a lot easier, faster, and as of September 21, free. During the Equifax hack that was first disclosed a year ago, the personal data, including birth dates and Social Security numbers, of over 148 million Americans (according to the latest Equifax estimates) were stolen. These were the crown jewels for identity thieves. 23% had other accounts opened in their name, including loans, debit cards, bank accounts, and cable, internet, or utility accounts. 10% had some sort of medical identity issue, including receiving a medical bill or collection notice for services they never received, learning that medical records were compromised, or discovering another person’s information on their medical records. 4% had either state or federal taxes filed fraudulently in their name to collect a refund. Other issues included email flagged as being on the dark web. A credit freeze at the three major credit bureaus cannot prevent all forms of identity theft and fraud, but it’s the single biggest and most effective defense mechanism consumers in the US can deploy. Wolf Richter initiated a security freeze with the major credit bureaus in 2010 after the University of Texas at Austin, where he’d gotten his MBA years earlier, notified him that all his data, including Social Security number, had been stolen. It was the Wild West of credit freezes. It was cumbersome, took weeks, and had to be done by a combination of fax, mail, and phone that involved a lot of road blocks they put in his way. But it was a great decision. As a positive side-effect, it stopped most of the “pre-approved” cash-advance and credit-card promos that showed up in the mail – an identity theft risk if they fall into the wrong hands – since credit bureaus could no longer sell my data to promoters. Making credit freezes & unfreezes available to all Americans for free in a quick and convenient manner is one of the best little things Congress has done for US consumers, and was long overdue. This entry was posted in Mortgage and tagged Credit Freeze, credit score, Equifax, Equifax Hacking, FICO Score on September 20, 2018 by Bone Fish. It turns out credit scores are statistical shorthand for a whole lot more than the likelihood you’ll repay a loan, according to a number of consumer surveys and academic studies. 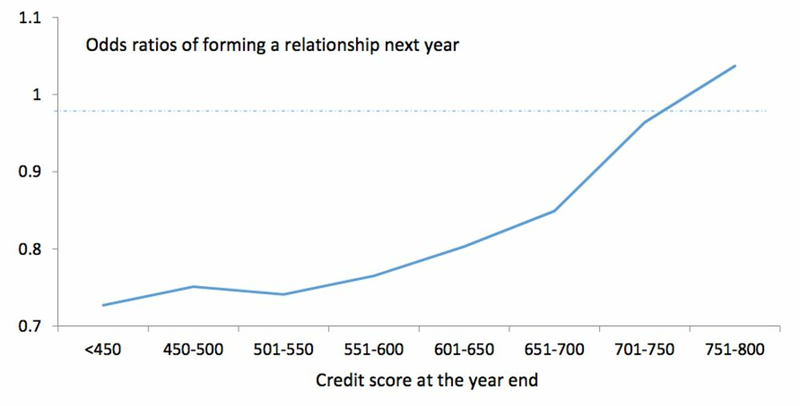 One study, released two years ago, looked at consumer credit data over 15 years and found that the higher the year-end credit score, the likelier the person was to form a romantic relationship over the next year. There is something to this. What do people want in a mate? Many want someone who is responsible, dependable, willing to commit, and able to maintain a relationship. What does it take to get a good credit score? Mostly a long history of responsibility, dependability, and careful maintenance of accounts. Both sexes in the survey valued financial responsibility highly—77 percent of females and 61 percent of men. Dating someone whose score is similar to yours when you meet increases the odds the relationship will succeed, a 2015 paper, Credit Scores and Committed Relationships (PDF), found. When you meet, because married couples’ credit scores tend to converge over time. The authors analyzed 15 years of data from the Federal Reserve Bank of New York Consumer Credit Panel/Equifax, which covers millions of consumers and provided detailed credit record information. 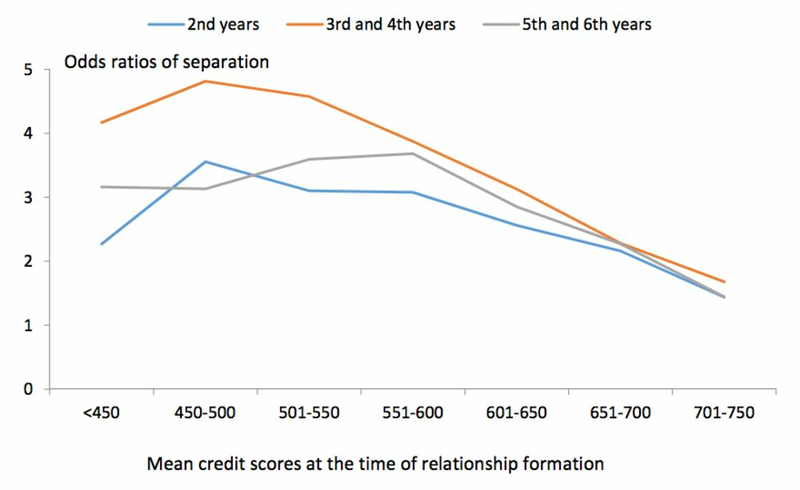 People “with higher credit scores are more likely to form committed relationships relative to other observably similar individuals” and more likely to maintain relationships, the authors found. They identified committed relationships by creating an algorithm to spot the formation and dissolution of marriages and long-term cohabitation. Mind you, it’s also true that people with excellent credit scores are likelier than those with bad scores to be frequent exercisers and bigger fans of Charlie Rose than of Jimmy Kimmel, and to prefer hockey to soccer and dogs to cats. And Taylor Swift to Kanye West. That’s according to a 2016 WalletHub survey of 1,000 consumers. Even if we accept that the score is a proxy for inclinations and tastes, guiding us toward people in the same socioeconomic circles with similar financial behaviors, can that 810 really release a rush of dopamine? Perhaps not, Fisher allowed, noting that dopamine is the brain chemical associated with feelings of intense romantic love. But there is a different brain system in which “it could really stimulate some of the molecular structure for attachment,” she said. That system is tied to mating and reproduction and involves feelings of deep attachment. A credit score could trigger feelings about reliability and responsibility and trustworthiness, which could trigger that attachment system, she said. At any rate (and that rate will depend on your credit score), daters may want to trust but verify. A survey done earlier this year for student loan company SoFi found that nearly 24 percent of respondents said a date or partner had lied to them about how much debt they carried. The 2,000 millennial daters surveyed said debt was the second second-biggest potential deal-breaker, behind workaholism. That may explain why 40 percent said they’d rather talk about their socially transmitted diseases than their debt. 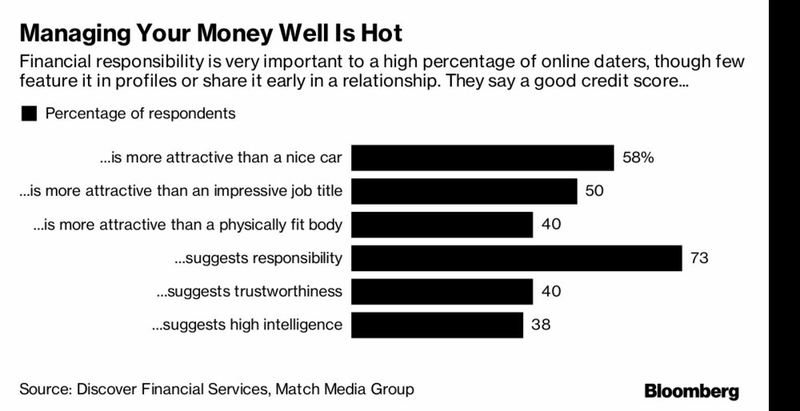 In the Discover/Match survey, only 7 percent of online daters said they would provide information on their credit score, debt level, income, and spending habits before meeting a date IRL. For most people, the soonest they’d feel comfortable sharing financial details is sometime in the first six months of a relationship. Her sweetest gift, a lambent 801. This entry was posted in Economy and tagged credit score, dating, love life, relationship on August 21, 2017 by Bone Fish. Back in August 2014, we reported that in what appeared a suspicious attempt to boost the pool of eligible, credit-worthy mortgage recipients, Fair Isaac, the company behind the crucial FICO score that determines every consumer’s credit rating, “will stop including in its FICO credit-score calculations any record of a consumer failing to pay a bill if the bill has been paid or settled with a collection agency. The San Jose, Calif., company also will give less weight to unpaid medical bills that are with a collection agency.” In doing so, the company would “make it easier for tens of millions of Americans to get loans.” Stated simply, the definition of the all important FICO score, the most important number at the base of every mortgage application, was set for an “adjustment” which would push it higher for millions of Americans. As the WSJ said at the time, the changes are expected to boost consumer lending, especially among borrowers shut out of the market or charged high interest rates because of their low scores. “It expands banks’ ability to make loans for people who might not have qualified and to offer a lower price [for others],” said Nessa Feddis, senior vice president of consumer protection and payments at the American Bankers Association, a trade group.” Perhaps the thinking went that if you a borrower has defaulted once, they had learned your lesson and will never do it again. Unfortunately, empirical studies have shown that that is not the case. The transformation is already in proces as the three major credit-reporting firms, Equifax, Experian and TransUnion, recently decided to remove tax-lien and civil-judgment data starting around July 1, according to the Consumer Data Industry Association, a trade group that represents them. The firms will remove the adverse data if they don’t include a complete list of a person’s name, address, as well as a social security number or date of birth, and since most liens and judgments don’t include all three or four, the effect will be like wiping the slate clean for millons of Americans. This change will apply to new tax lien and civil-judgment data that are added to credit reports as well as existing data on the reports. Civil judgments include cases in which collection firms take borrowers to court over an unpaid debt. Ankush Tewari, senior director of credit-risk assessment at LexisNexis Risk Solutions, says that nearly all judgments will be removed and about half of tax liens will be removed from credit reports as a result of the changed approach. He says LexisNexis will continue to offer the data directly to lenders. In addition, if public court records aren’t checked for updates on lien and judgment information at least every 90 days, they will have to be removed from credit reports. The WSJ notes that the unusual move by the influential firms comes partially in response to regulatory concerns. The three reporting bureaus rarely tinker with the information that goes on credit reports and that lenders consult to gauge consumers’ ability and willingness to pay back debts. The Consumer Financial Protection Bureau earlier this month released a report citing problems it found while examining credit bureaus and changes it is requiring. Issues the agency cited included improving standards for public-records data by using better identity-matching criteria and updating records more frequently. Inaccurate information on credit reports, especially if it is negative information, can derail consumers from being able to gain access to credit and even lead to other setbacks like not being able to rent an apartment or get a job. One in five consumers has an error in at least one of their three major credit reports, according to a 2013 Federal Trade Commission study mandated by Congress. The three credit bureaus received around eight million requests disputing information on credit reports in 2011, according to the CFPB. It won’t be the first time such an exercise is conducted: in 2015, as part of a settlement with the NY AG, credit-reporting firms were already prompted to remove several negative data sets from reports. These included non-loan related items that were sent to collections firms, such as gym memberships, library fines and traffic tickets. The firms also will have to remove medical-debt collections that have been paid by a patient’s insurance company from credit reports by 2018. Such changes might help borrowers and could spur additional lending, possibly boosting economic activity. But it could potentially increase risks for lenders who might not be able to accurately assess borrowers’ default risk. Consumers with liens or judgments are twice as likely to default on loan payments, according to LexisNexis Risk Solutions, a unit of RELX Group that supplies public-record information to the big three credit bureaus and lenders. For lenders and credit card companies it means one thing: chaos, and the potential of substantial future charge offs: “It’s going to make someone who has poor credit look better than they should,” said John Ulzheimer, a credit specialist and former manager at Experian and credit-score creator FICO. So how many US consumers will be impacted by this change? The answer: up to 12 million. While for many of these consumers, the score increase will be relatively modest, as FICO projects that just under 11 million people will experience a score improvement of less than 20 points, that should be more than sufficient to go out and buy that brand new $60,000 BMW with an 80-month, $0 down, 0% interest rate loan. Sarcasm aside, ultimately lenders will still be able to check public records on their own to find this information, and since FICO scores will now be “adjusted” just like GAAP, the likely outcome will be the transition of credit vetting in house, as Fair Isaac loses credibility within the loan system, potentially leading to even more draconian credit terms, even if it comes at substantial expense to US-based lenders. This entry was posted in Housing Market, Mortgage and tagged credit score, FICO Score on March 14, 2017 by Bone Fish. Some of America’s most racially integrated neighborhoods and cities are on a path to becoming segregated all over again. In Los Angeles this means neighborhoods where Latinos and Asians now live alongside black or white neighbors may have few to no whites or blacks in 10 to 20 years. Covina, 22 miles east of downtown L.A., provides an example of one city at risk of re-segregating. Whites make up about 26% of Covina as of 2014 and Latinos about 57%. Typically we consider neighborhoods with at least 10% of each group to be racially integrated. But the mix is crumbling. Latinos made up 13% of Covina’s residents in 1980, 26% in 1990, 40% in 2000, and 52% in 2010. Four years later, according to the most recent census estimate, the Latino population had grown by five more percentage points. By 2025, Covina is likely to be overwhelmingly Latino. What’s causing a shift from mixed to single-race populations? White preferences are another major factor that helps explain re-segregation. Segregation is not, however, inevitable. Our statistical model found that in 20% of L.A. neighborhoods we examined, whites, blacks, Latinos and Asians have been living together for 10 to 30 years, and no group’s population is changing much faster or slower than any other. In fact, among L.A., Houston, Chicago and New York, Los Angeles had the highest proportion of these “quadrivial” neighborhoods. There are ways to encourage integration. The Department of Housing and Urban Development has taken a positive step in this direction by requiring all grant recipients to show how they would promote integration, although Congress is threatening to undo this rule. At a local level, investment in neighborhood infrastructure, especially schools, attracts diverse residents and promotes integration. There is also new research that shows whites are choosing same-race neighborhoods not solely because of prejudice or animus, but because they don’t know about more mixed areas. In a separate study of Chicago area residents, for instance, whites were 2 to 6 times less likely than Latinos to even know about majority Latino neighborhoods. Because so much of the shift in integration is based on whites’ decisions about where they will move next, Los Angeles’ future demographic patterns are in their hands. If whites do their homework, and find out more about neighborhoods that are now unfamiliar to them, they can make L.A. an example to the nation of how to create integration in the 21st century. Otherwise, knowingly or not, they may reproduce the problems of racial segregation for the future. This entry was posted in Housing and tagged credit score, Los Angeles, race, resegregation, segregation on April 6, 2016 by Bone Fish. WASHINGTON — For more than 20 years, Mark Vinciguerra’s small bank specialized in making home loans to first-time buyers in the Toledo, Ohio, suburbs. Then the recession hit, and auditors at Fannie Mae and Freddie Mac came knocking. The mortgage giants demanded he buy back more than 200 loans he’d sold them that were teetering into foreclosure, claiming the bank had failed to meet their quality standards. Vinciguerra ultimately repurchased only five loans, but endless hassles over the others shattered his willingness to take a chance on some moderate- and low-income borrowers. Just as the housing recovery should be taking off, lenders are turning away potential buyers by demanding unusually high credit scores for government-backed loans — exceeding the government’s own criteria in a bid to insulate themselves from penalties and lawsuits. The reluctance to lend has alarmed policy makers and heightened tensions between them and lenders. The White House has summoned banking executives for a meeting Sept. 17, frustrated that its many pleas to ease lending criteria have not been heeded. But lenders say the mixed messages they’re getting from Washington give them no incentive to widen access to credit. The government, determined to prevent a repeat of the irresponsible lending practices that sparked the housing bust, has forced lenders to buy back billions of dollars in loans and continues to trumpet massive legal settlements with the industry. The largest came two weeks ago when Bank of America agreed to pay $17 billion to resolve claims that it sold the government defective mortgages. ‘‘The mortgage industry is basically ticked off,’’ said Guy Cecala, publisher of the trade journal Inside Mortgage Finance. The situation is untenable for lenders, said David Stevens, president of the Mortgage Bankers Association. It’s also creating a homeownership opportunity gap. Fannie, Freddie, and the Federal Housing Administration collectively own or back nearly half of all US mortgages, Inside Mortgage Finance says. None of them makes loans, though they are critical to making mortgages widely available. Fannie and Freddie buy loans from lenders, package them into securities, and sell them to investors. For a fee, they guarantee the mortgages and then pay investors if the loans default. The FHA insures the lenders it works with against losses if loans go bad. But housing experts say the government’s push to hold the industry accountable for loose lending in the past is unintentionally steering lenders toward the highest-quality borrowers, undermining the institutions’ mission to serve the broader population, including moderate- and low-income families. ‘‘What we have now is a system, because of tight lending standards, that is excluding far more borrowers who are going to succeed than fail,’’ said Barry Zigas, at the Consumer Federation of America. Industry insiders say the administration could help by encouraging regulators to ease up. Lenders should be held accountable for the type of fraudulent activity that took place before the housing crisis, such as falsifying documents or faking tax returns, they say. But they argue the government should not be scouring loan files for minor errors. Industry insiders also argue for clearer rules governing when Fannie, Freddie, and the FHA can take action against a lender. Many lenders said they had been asked to buy back loans or reimburse the government for losses even when their lending practices had nothing to do with the loans’ default. Bill McCue, president of McCue Mortgage Co. in Connecticut, said investors routinely refuse to buy FHA-insured mortgages if the borrowers have credit scores below 640, even though the FHA typically permits scores as low as 580. There are 13 million potential borrowers with scores between 580 and 640, yet FHA-backed loans to people below the 640 threshold were basically nonexistent last year, according to an analysis by the Urban Institute. This entry was posted in Uncategorized and tagged credit score, credit scores, Fannie Mae and Freddie Mac, FHA on September 9, 2014 by Bone Fish.